It has been awhile since we have done any recipes, so here we go! Winter time makes me want to eat all things comfort food… However, I don’t love to cook, so it has to be easy. After having a couple cans of crescent rolls that needed to be used, I found two delicious recipes that were so easy and were a huge hit with the whole family. These would be easy to do in an RV, or at home! Grease a pizza or jelly-roll pan. Press rolls out with fingers onto pan. 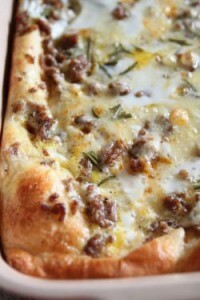 Layer top of dough with cooked sausage, potatoes, cheese and onion. Beat eggs and milk and pour egg mixture over the toppings, tilting pan to evenly distribute mixture. Sprinkle with salt & pepper. Place pan on oven rack and bake at 375 degrees F for 25 minutes. This has become a family favorite and a go-to dessert. I hope you enjoy it too! Combine berries, pears, flour, and cinnamon and pour into 9×11 baking dish. Unroll crescent rolls and lay over top of fruit. Mix topping ingredients and pour over crescent rolls. Bake at 350 F for about 30 minutes. 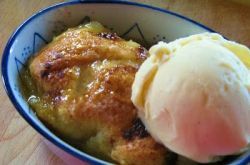 Serve warm with vanilla ice cream and enjoy! If you try either of these recipes, let us know how you like it! We love to hear from you here, or on our Facebook page!